Somehow my daughter and I have not been able to sleep this weekend. Both on Saturday and Sunday, we were up by 7 a.m., which was incomprehensible a mere few weeks ago, particularly after going to sleep much too late (is 11:30 p.m. late?). But our mornings started very early, and we found ourselves this morning wondering how we should take advantage of the extra time our bodies seemingly had given us. That led to our awesome Sunday fun-day. Even with the early start, we didn't get out of the house until noon. I'll mention that my daughter, Melody, is a new addict of Minecraft, after she talked me into downloading the popular game for her yesterday morning. As creatively fertile her mind seems to be, I finally talked her into shutting down her laptop and we readied ourselves for our great day. We went to Frederick, MD, a place we've been to many times but rarely explored. The central part of the city is actually pretty cool. We found a place to park and began to wander a bit. There were a LOT of people doing much the same. We decided to get lunch at a place I read about online, called Pretzel and Pizza Creations. They specialize in pretzels, the soft German-style kind, and the pizza is made with the pretzel dough. 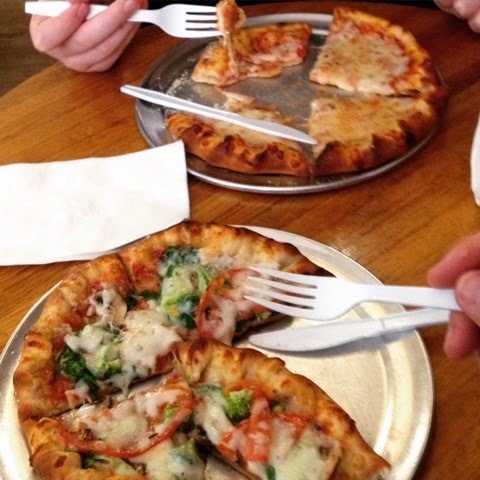 We ordered two 8-inch pies, and they were really good. The place is in a cozy old building with barely enough room to move around. It was a neat place, despite how crowded it was. 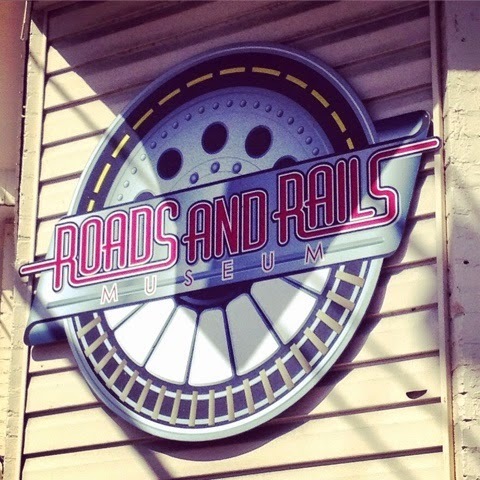 We continued our adventure with a walk down the block to the Roads and Rails Museum. This place is really cool. 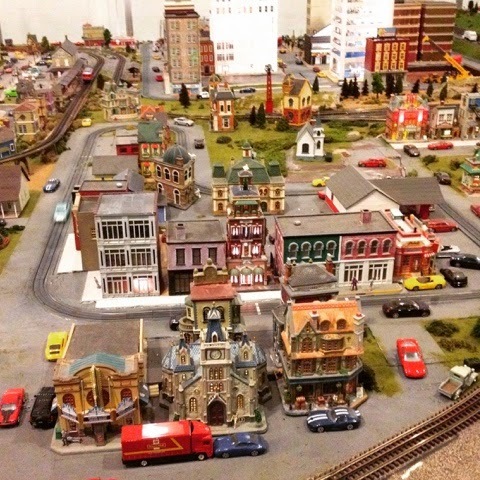 If you've ever been to Roadside America in Shartlesville, PA, an incredibly detailed miniature model railroad set up in a large building back in the 50s, located just off interstate 78, then you'll be really impressed with this modern version inspired by the original. It is larger and much more detailed, and the guys who put it together and built it provided numerous little humorous touches throughout. We spent a good hour examining it, and we plan to visit it again because we're sure there was much else we missed. Exploring it is fun. And a separate room has a large Lego creation, too, with many Lego sets from my childhood. Again, it was a blast just exploring all of the little hidden details and humorous touches. My daughter who is 11, really enjoyed it, and I'm a big kid, anyway, but I can only imagine kids of all ages would enjoy this place. It was well worth our time. We walked back up towards the part of town we started in and returned to Pretzel and Pizza Creations to get a few pretzels to go. We got a chocolate chip stuffed pretzel, as well as a "bald" pretzel. About a block up and across the street, we came across another little shop. This one, called the North Market Pop Shop, has hundreds of hard-to-find vintage soda pops for purchase. Represented are sodas from the Appalachain Brewing Company, Kutztown, Sioux City, Dang, Moxie, Nehi, Fanta, Crush, Dr. Brown's, and many more. 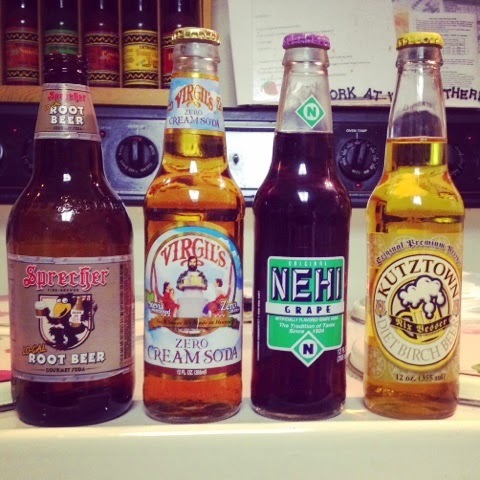 I got a Sprecher Lo-Cal Root Beer and a few others, and I talked Melody into trying a Nehi Grape Soda. It was a lot of fun. We decided to begin our trek home, but we took the old National Road (MD Route 144), which took us through a lot of neat small towns, including New Market, Mt. Airy, Lisbon, and West Friendship. We stopped off at Crest Lawn Memorial Cemetery, where my wonderful wife, Teresa, was laid to rest. We grabbed some dinner at the Double T Diner in Ellicott City, then came home and crashed for the night. Thank you, Lord, for giving us a beautiful day of travel. We love road trips, and we had a particularly great day of it.